When it feels this damp, time has come to swap your water bottle for a thermos. Whatever the weather, this small thermos from Stanley will help keep you warm however you travel. We have a 0.47 litre Stanley bicycle thermos worth £30 to give away. Simply leave a comment at the bottom of this page and let us know what you’d fill it with. We’ll pick a winner next week. This week’s commutes might have felt miserable, but it’s all relative. The pioneer adventure cyclists of the 1890s who took to the snowy wilds of northern Canada without the benefit of modern clothing (and 80 years before mountain bikes) knew a thing or two about cycling in the extreme cold. The Great Gold Rush drew 100,000 prospectors to the Klondike region of the Yukon in north-western Canada between 1896 and 1899. Those who didn’t have the money to invest in dog teams used bicycles and rudimentary cold weather gear. For 29 years we have been providing this kind of straightforward, affordable bicycle insurance. Little wonder The Good Shopping Guide judges us to be Britain’s most ethical insurance company. I would fill it with hot lingonberry juice, to remind me of being in the snow in Sweden! Hot blackcurrant made with homemade cordial – a taste of summer in the depths of winter. I would fill it with hot chocolate, to keep me warm and give me calories to carry on!! Hot Marmite has to be in there! If not, it will be basic ‘char’ – good old teabag tea. I would fill it with decaff coffee – heat without hyperactivity! I had one of these exact thermos when I was in the army. A few years later, when back in the UK, I lent it to my dad – who then left it on the roof of a cathedral (he was a stonemason). Never got it back. This would be a good replacement after going without my Thermos the past 30 years!!! I’d love one of these. Ours leaks. Needed this today, 2 punctures and a total soaking. What an absolutely spiffing idea. Soup, mushroom, tomato, whatever is on the oven. Old school style for a veteran cyclist! For me it would be gløgg, gluhwein,vin chaud or mulled wine – depending on brexit of course…. Hot marmite drink or homemade soup. It might be a slightly unconventional cycling fuel, but it’s got to be Heinz Tomato soup. Broth to fuel me up those hills! Good heartwarming homemade soup, probably something spicy like a Mexican bean. The prospect of taking my wife’s wonderful smoked bacon and lentil soup on a winter ride – heaven indeed! I should have said soup! It has to be tea. Hot chocolate with a splash of dark rum. Only to be consumed on arrival you understand! On a long ride on the coldest days recently, I would have been glad of any hot drink in one of these. Just plain boiled water from the kettle! Definitely hot chocolate, for the calories. I’d love this for my morning coffee on the way to work. My choice would be steaming hot Ribena for winter rides on my classic Bianchi bicycle. Think the colour of this flask will even match the frame! Does it fit in a standard water bottle cage? If so, I would love one! I’d fill the beauriful flask with hot steamy ‘mocha’ hmm. I’d fill it with anything sweet as still bitter about the wife chucking my faithful 15 year old flask as took up too much space in the cupboard! Keep it simple – black Coffee. Great all year round, perfect in the summer on those cycling/camping trips and a good hit of hot caffeine to warm the toes & fingers in the winter. Nothing can beat a nice hot chocolate on a cold ride. Hot with some calories and tasty as well. 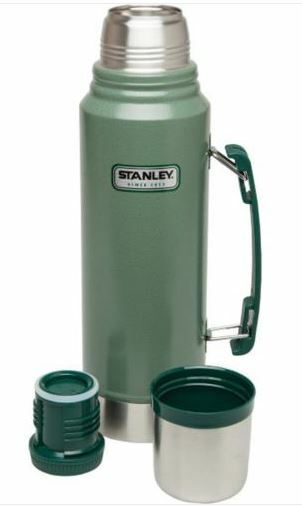 Stanley is the original and best thermos! I had the one from my grandparents for years! I’d use it for all types of hot drinks, but soup is a great warmer after a walk/ride in the cold! Just the thing to keep the inside warm on those bitterly cold mornings in the frozen north!